EPA Administrator Scott Pruitt is the latest Trump administration Cabinet official to be ousted or abruptly leave, after his resignation was accepted Thursday by President Donald Trump. “Within the Agency Scott has done an outstanding job, and I will always be thankful to him for this,” the president tweeted. Andrew Wheeler, who will become the acting administrator, previously worked for Republican Sen. James M. Inhofe of Oklahoma. Inhofe had defended Pruitt, a former Oklahoma attorney general, after meeting with him last month. “I have no doubt that Andy will continue on with our great and lasting EPA agenda. We have made tremendous progress and the future of the EPA is very bright!” Trump said on Twitter. 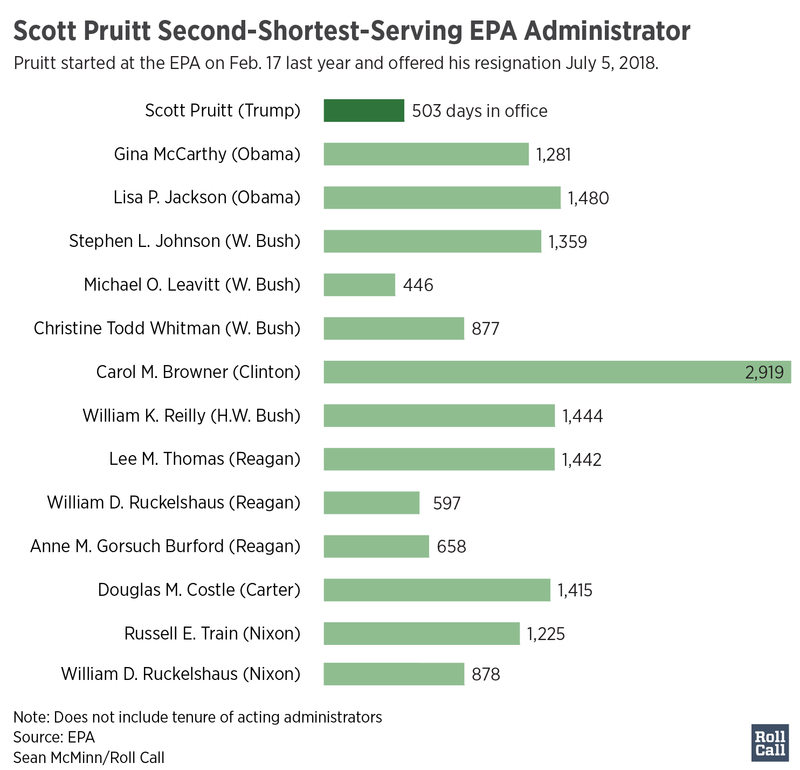 Pruitt has been under fire in recent months over a series of controversies, drawing scorn from both Republicans and Democrats, including some GOP figures who have at times had Trump’s ear.. He was confronted Tuesday by a 33-year-old sixth-grade teacher, who was holding her two-year-old son at Washington restaurant Teaism. She urged him to step down in a confrontation caught on video. Earlier this week, reports surfaced of a former aide telling lawmakers that Pruitt made 20-something staffers book expensive hotel rooms and pay for them. He never paid them back. Pruitt also raised eyebrows by allegedly ordering his aides to search for a used mattress from the Trump International Hotel near the White House. Among other scandals, he had a questionable — and cheap — arrangement for lodging with the wife of an energy lobbyist, and pushed for massive pay increases for several staffers. Trump told reporters traveling with him to Montana later Thursday that he was “extremely happy” with Pruitt’s job performance. Trump also said there was “no final straw” that led to Pruitt’s departure. One Democratic member was quick and pithy when reacting to the resignation news. “It’s about time,” Ohio Rep. Tim Ryan said in a statement. “One down with the resignation of @EPAScottPruitt, dozens more to go until we’ve drained the swamp of the Trump Admin’s toxic culture and corruption,” House Minority Leader Nancy Pelosi tweeted.